Whether talking about MLK, Trump, or social media, the Warriors’ sage head coach displays all the class and leadership our government sorely needs. Also, the A’s have moved their team offices to the Oakland waterfront. 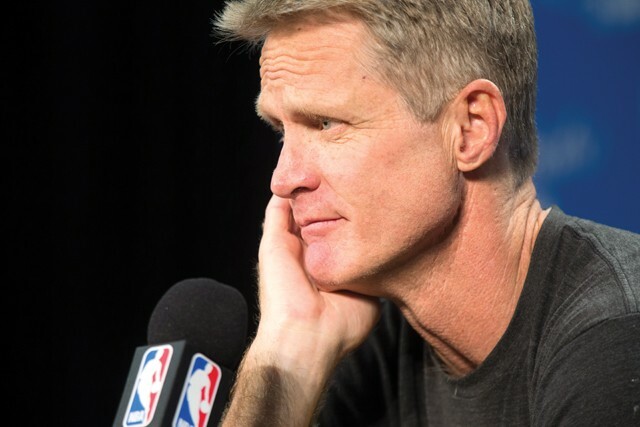 If we’re going to start considering nonpoliticians like Oprah for president in 2020, I hereby call for Steve Kerr to throw his hat in the ring. The Warriors coach has spent much of the past year weighing in on a wide range of issues such as Donald Trump, social media, Martin Luther King Jr., the state of sports media, and the declining quality of political discourse. Speaking of the bad old days for Oakland’s basketball team, give yourself a post-Christmas gift and start following this Warriors-themed Twitter account: @Thisdayinsuck. It celebrates — darkly but humorously — past Warriors transactions involving terrible players, serving as a daily explanation of why the pre-Steph Curry Warriors were absolutely awful. Here’s one recent example: “1/13/2001 — Warriors sign Chucky Brown to a 10-day contract which sets an NBA record for Brown by playing with his 11th NBA team.” Wow. The Warriors really were unwatchable back then, and that tweet by itself explains it all. Give @Thisdayinsuck a follow, if only to appreciate how wonderful the Dubs are now. …. The A’s deserve similar kudos for their new Jack London Square office, to which they recently moved. The swanky headquarters offer stunning views of the Oakland waterfront and contain several displays celebrating the franchise’s rich 117-year history. A number of rooms in the office are named after Oakland neighborhoods, such as Laurel and Jingletown, and the A’s’ #RootedinOakland slogan appears on TV monitors throughout the new facility. Inside the office, it feels like a new era for Oakland baseball. Hopefully, that vibe translates into more wins — on and off the field — for the Athletics. Some things never change. Loyalty for Davis and the Raiders is always a one-way street.